Answering The Three Career Questions will prevent you from spending your whole career finding one-job-in-a-row. It gives you a bigger theory of the game – a way to think about and take actions regarding your career for the rest of your life. Each time your job crashed, the “Parachute” book helped you launch again and land a new job. 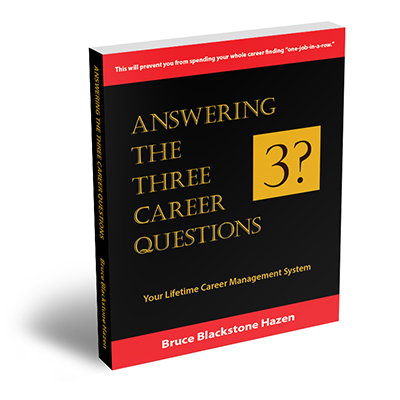 The Three Career Questions book and career management system will keep you aloft in the first place and help you reduce the number of “unscheduled landings” you’ll have to endure and recover from throughout your working years. The Three Career Questions completes your “flight operations manual” for career management success. Now, you can stay aloft longer and make the moves you choose, not the ones dictated by the rapidly approaching ground. Are you age 28 – 58? Stop making unnecessary and unscheduled career stops. Undergrad? MBA? You’ve got a chance to get this right in the first place. This is isn’t Business Strategy 101. It’s Career Strategy for #1. The Three Questions: You’ve already had to answer them more than once in your career. Why not use a proven method to answer them proactively. Your Career Tornado: Tired of spinning up the same career conversations in your head, over and over again? You get distracted and then, two hours later, you’re spinning up the same conversation about your career all over again. Stop the tornado with a career strategy. Networking made easier and more professional. It requires a PINT. At last. A Compelling System: Interlocking questions and HOW they act as your internal guidance system to manage your career over a lifetime. Starting now. Right now. Business Model You: A One-Page Method for Reinventing Your Career. By Tim Clark. John Wiley and Sons, 2012. The Complete Handbook of Coaching. Chapter on Career Coaching. Bruce Hazen and Niki Steckler. Sage Publications, 2009.